It's been a while since we've done one of our lists of top essential trade paperbacks (see our Superman and Batman lists), so here's a guide to Wonder Woman trade paperbacks. There's a good amount of modern Wonder Woman trade paperbacks out there, though they collect runs from just a couple of different creative teams. So, instead of offering a ranked list here, we're going to give an overview of the various modern Wonder Woman eras you can read in collected form. * Wonder Woman: Who is Wonder Woman? Find all of these books on sale at the new Collected Editions trade paperback store! What's your favorite Wonder Woman story? fwiw, I liked the Hiketeia hardcover story (it might be available in SC form), but it's an original story, not a collection. 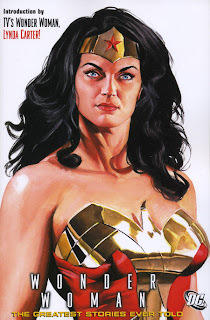 Favorite WW stories: The Orana two-parter (pre-Crisis), The Treasury Edition of Superman vs. Wonder Woman, and the Perez "Who Killed Myndi Mayer?"